Economic hardship helped spur the search for a national artistic identity. The 1930s were unsettling years. During the Great Depression, widespread unemployment fueled discontent, xenophobia, racial tension and disillusionment with the nation's direction. Yet artists grappled with the idea of a national art that would help forge a new American identity. It was to be specific to this country, expressing national values and addressing native themes. There was, of course, no such thing—no stylistic agreement and no accord on appropriate subjects for art. 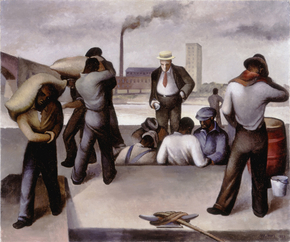 Regionalism, which favored figurative portrayals of the American heartland and stressed traditional bedrock values, flourished alongside social realism, which took up injustices. So did abstraction, surrealism and other modernist modes that looked at national issues through newer lenses, often influenced by foreign aesthetics. "America After the Fall: Painting in the 1930s" at the Art Institute of Chicago surveys this largely unexamined period and presents an abundance of strong, even splendid works. Some are by well-known artists, but the 50 works on view also include many by artists whose work is too little known; several have been pulled from museums' storage. The array, which reveals a period awash in artistic experimentation, is uneven at times, but always intriguing. The decade's immense creative range is illustrated in the introductory gallery. At its center is Grant Wood's "American Gothic" (1930), the dour duo of Iowa farmers who hew closely to their land and their homespun values. Nearby is Stuart Davis's "New York – Paris No. 3" (1931), its polar opposite. Invigorated by a visit to Paris, Davis painted a medley of mostly New York images (skyscrapers, street signs, gas pumps). They float in a flat space, rendered in the high-spirited style that Davis was developing as his particularly American brand of Cubism. In between, stylistically, are two now-iconic works, Georgia O'Keeffe's "Cow's Skull: Red, White, and Blue" (1931), a surrealistic vision of the Southwest, and Edward Hopper's realist "Early Sunday Morning" (1930), a silent ode to the emptiness felt by many at the time. "Double Portrait of the Artist in Time"
From there, American art spreads out as vast as the nation itself. Judith A. Barter, the Art Institute's chairwoman of American art and organizer of the exhibition, seems to have gone on a broad-based reconnaissance mission and found several works that were new even to her. There is, for instance, Paul Sample's "Church Supper" (1933), a wry slice of Americana she discovered at the Museum of Fine Arts in Springfield, Mass. Set in the countryside, it shows Sunday-best-dressed wives serving dinner to their menfolk, who only have eyes for the glamorous blond interloper. 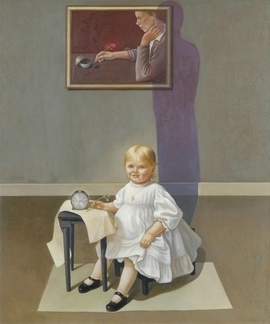 And there is Helen Lundeberg's moving, surrealistic "Double Portrait of the Artist in Time" (1935), which depicts her as a happy child who grows into the sadder, worldly woman in a wall portrait, connected by a ghostly shadow. Covering just a decade, the paintings here are grouped into themes, not by styles. It may sound jarring to hear that Arthur Dove's abstract "Tree Trunks" (1934) hangs near agrarian paintings like Marvin Cone's pastoral "River Bend No. 4" (1938) and Alexandre Hogue's grim "Erosion No. 2—Mother Earth Laid Bare" (1936), whose barren mud hills literally form a supine female body. But they all fall comfortably into the "Retreat to the Land" section. Likewise, in other galleries, artists comment on "Industry and Labor," "History Renewed," "Urban Entertainments," "Dystopian Visions" and "Modernism Redefined." In each, there are celebrated artists like Marsden Hartley, Thomas Hart Benton, Alice Neel and Charles Demuth—including some classic pictures like Charles Sheeler's "Classic Landscape" (1931), his stripped-down depiction of Ford Motor Co.'s River Rouge factory. I was more drawn to the revelations. Close to that Sheeler, the self-taught artist Joe Jones provides the other side of the industrial story in "Roustabouts" (1934). With verve and rhythm that lift the work above cliché, Jones paints a picture of hardworking black dockworkers, some exhausted, overseen by a white supervisor whose white shirt calls attention to his hefty belly. Jones's other painting here is the strange, disturbing "American Justice" (1933). It features the corpse of a half-naked female lynching victim, her eyes rolling into her skull, in the foreground, while Ku Klux Klan members gather, chatting, near the house they torched. 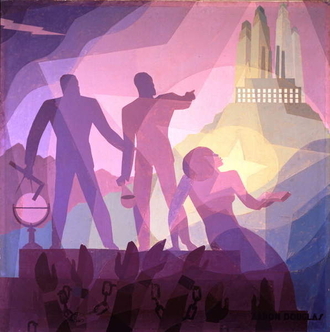 Aaron Douglas is more hopeful in "Aspiration" (1936), one of four mural paintings he made about black contributions to society. He somehow successfully mixed Egyptian, African, Cubist and realist styles to present educated blacks enjoying achievement, moving toward a fabled city on the hill. Yet they stand on a platform above the manacled hands of slaves, their forefathers. Like those examples, almost every painting here evokes emotion. The '30s were that kind of decade, dark but not without humor and aspiration—and somewhat comparable to the current national mood, which has yet to bounce back in spirit from the 2008-09 recession. Fittingly, the exhibition ends with paintings that represent the two paths American art would take in the coming decades. Hopper's "Gas" (1940), of a lonely gas station, paved the way for the emergence of Pop Art. And Jackson Pollock's symbolic, rhythmic "Untitled" (c. 1938-41) points the way to abstraction. Together, the two trends would pull the art world's center from Paris to New York.